I made a lot of soup this winter and came to appreciate the joy of home-made stock. With just a little extra work, you can get a stock pot going and then forget about it for at least 45 minutes. Strain it and you have a flexible base for a lot of good meals. It freezes beautifully, so make more than you need and bank some in the freezer for a future meal. Spring allergy season has begun early in Boston. It’s predicted to be an especially bad year because of our mild winter. It’s also several weeks early. We felt particularly under the weather last weekend, so I decided to cash in two jars of stock from the freezer stash. A quick and healthy meal can be had with two eggs, some pre-made stock, some leftover cooked grains and a handful of something leafy and green. Enhance the flavor as you time an inclination permits. If we’re feeling really under the weather, I add a few cloves of garlic to the stock and boil for at least 15-20 minutes. This time I sauteed some sliced garlic in olive oil and added it at the end, along with some chopped green onions. I had leftover cooked buckwheat in the fridge, but really any grain would do. I especially enjoy small round grains like quinoa and millet. Bring stock to a boil, taste for seasoning. Crack eggs into 4 small bowls (like ramekins). To poach eggs, bring bowl very close to the boiling stock and gently tip in. Repeat with other 3 eggs, giving each egg a little room. Gently boil for about 3 minutes. While eggs are cooking, saute garlic in some olive oil, taking care not to let it brown. Divid preheated grains between two large soup bowls. Top with a generous handful of baby spinach (you can use a lot here–it will reduce down to nothing once the soup hits it. Stir sauteed garlic into broth, taking care not to break the eggs. Gently spoon 2 eggs into each bowl and divide the stock evenly between the two bowls. Top with sliced green onions. My patients have been requesting that I post recipes that are quick and healthy, and I can’t think of anything easier than a whole-grain salad made with some leftovers and a few things you probably have on hand already. I almost always have some odd bits of left over brown rice, quinoa or buckwheat lingering in the fridge. I like to use it to whip up a salad as either a quick meal (made more filling with some canned beans), or a side dish to go with a piece of fish. It’s also a great way to put those bits of cilantro and parsley to use when you have just a little leftover from something else you’ve recently made. I don’t really follow a recipe–I just use whatever is on hand, and dress it with olive oil and lemon juice (or vinegar). For the dressing, think about combining 3 parts olive oil with 1 part vinegar/lemon juice. Add salt and pepper and any other seasonings to taste. You can also add 1 teaspoon of dijon mustard. It’s best to mix the dressing in a separate container, beat it with a fork and taste to see if you need to add any more of anything. When you put it together, the grain should be the predominant item in your salad. Add as much or as little of the other ingredients as you like. Mix everything together and let it sit at room temperature for about 30 minutes (assuming you have that kind of time–otherwise just eat it right away). The picture above comes from this nice blog I recently discovered, Tale of Two Vegans. Check it out! I’m a big fan of the high-protein grains quinoa and amaranth. They fill me up and keep my energy steady for hours. I like to cook them together with millet to make a breakfast porridge, and also to use instead of rice in one of my stews or quickie rice/veg/egg lunches. Teff is another high-protein grain, and one I’ve neglected for far too long. Teff is rich in minerals with a healthy dose of calcium and iron, making it ideal for women (and men, too, of course). It is also gluten-free, making it a nice addition to a gluten-free diet. 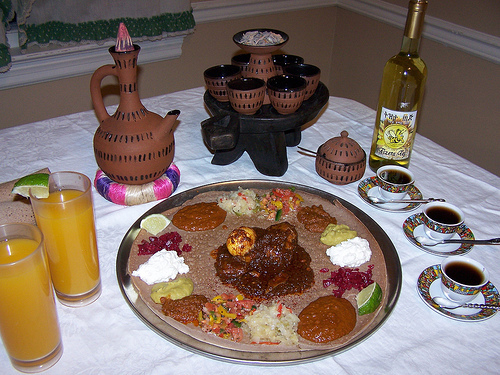 Teff flour is used to make injera, an Ethiopian flatbread that is used both as a serving dish and a utensil. If you haven’t eaten at an Ethiopian restaurant, I highly recommend it. Just be prepared to eat with your hands. We like Asmara in Cambridge. Addis Red Sea in Boston is also quite good. My Ethiopian patients tell me that Fasika in Somerville is the best place. I’ve been experimenting with both the grain and the flour this week. Since teff cooks up fairly sticky, like amaranth, I’ve been enjoying it for breakfast. For my most recent pot, I added some chopped sweet potato and cinnamon, and I’ve been reheating it with soy milk, raisins and pecans. I tried the Bob’s Red Mill Teff Chocolate cake recipe, and while I liked it, it wasn’t chocolaty enough for my taste. I will experiment with it and post an updated version in the future. One great thing about the cake, though, is that it’s very filling (which is a good thing–it’s filling you up with high-quality protein). One down side to adding teff to your diet is that it’s hard to find it at the store. Whole Foods in Cambridge carries teff flour, but not the grain. I order all of my grains from Bob’s Red Mill, and I think teff is definitely worth the trouble of ordering. It’s cold here and Boston, and I’m suddenly, happily, more interested in spending time in the kitchen. Summer cooking is a challenge–the farmer’s markets are brimming with beautiful veg, but I want to spend my time lollygagging on the patio, not sweating in the kitchen. So, while the cold weather has it’s challenges, it makes me want to cook. I’ve been making a lot of soup lately. I think of soup as a perfect food–I pack them with veggies, and usually include some type of bean and serve it with brown rice or quinoa. I’ve also been making my own stock lately, which makes a huge difference in the quality of the soup. Stock always seems like a lot of work, certainly harder than using a bouillion cube or opening a carton of your favorite store-bought stock. It really isn’t, though. Coarsely chop some veggies (with skins intact for extra flavor), saute them in some olive oil, add water and some herbs and leave it to simmer on the stove while you do other things. My current approach is to make a big pot of stock, and then use it as a basis for two different recipes. I also try to freeze some for some future time when I don’t have time to make stock. It doesn’t feel like that much work when you can use a pot of stock to make a couple of dishes. This week I make Deborah Madison’s Vegetarian Cooking for Everyone “>Vegetarian Cooking for Everyone mushroom stock using my favorite dried mushrooms, Maitake/Hen of the Woods and a few shiitake. Maitake/Hen of the woods (pictured above) are super-delicious mushrooms with wonderful health benefits. They helps strengthen the immune system and have anti-viral and anti-fungal properties. Research has also shown that they have tumor-fighting properties and can help regulate blood sugar. I buy dried Maitake from Mountain Rose Herbs and use them almost every time I make stock. Shiitake (pictured above, growing on logs) have similar immune-stimulating, anti-tumor and anti-bacterial effects. They’re easily found at any Japanese market and most Asian markets. Mountain Rose Herbs also carries dried Shiitake. I buy them fresh at my local Whole Foods Market, as well. Fresh Maitake and Shiitake are quite expensive, but a little goes a long way. Dried mushrooms tend to be less expensive and are almost as nice as the fresh, depending on how you prepare them. With cold season upon us, it make sense to use as many maitake and shiitake as possible. This batch of Mushroom Stock went towards making a Celery root/brown rice gratin (also from Deborah Madison’s book) and a pot of lentil soup (recipe to follow later). These two dishes gave us several lunches and a dinner–a great reward for the work. The original gratin recipe called for wild rice, but my husband doesn’t think wild rice is good for eating, so I made it with brown rice. The added step of making the bechamel sounds like a lot of work, but once you throw it together it’s not hard to keep 1/2 an eye on it while you do other things. Just keep the fire low and remember to stir. Or use a double-boiler. 1. Clean any dirt from dried mushrooms. Soak in hot water while you prepare everything else. 2. heat oil in a soup pot, add onion, carrots and celery. Saute over medium-high heat until the onion is browned, about 15 minutes. 3. Add mushrooms and their soaking liquid along with the remaining ingredients. 4. Add about 9 cups of water and bring to a boil. 5. Reduce heat and simmer, partially covered for 45 minutes. 4. Heat olive oil in a skillet. Add celery root with lemon jice, garlic and 2 tbsp parsley. Cook until tender, about 5-7 minutes. Add salt and pepper to taste. 5. Combine rice, celery root, pecans and bechamel. Spread into prepared baking dish. Bake for about 20 minutes. Top with grated hazelnuts and return to the oven for another 5 minutes or so. 1. Cook shallots/onions in olive oil in a small saucepan over low heat for about 3 minutes. Stir in the flour and cook for 2 minutes more. Whisk in the stock all at once, then cook for 20 minutes, stirring frequently, or in a double-boiler for about 30 minutes. Add salt and pepper to taste. My work as an acupuncturist allows me to have lunch at home several days a week, and it’s something I’ve come to enjoy immensely. I love to cook, but I don’t want to go to a lot of trouble in the middle of the day (too much time, too many dirty dishes), so my challenge is to find something quick and healthy that I can whip up quickly. Lately, all of my lunches involve eggs in various forms. I never get tired of eating them since you can do so many things with them. Eggs are an excellent source of protein for my mostly vegetarian diet, and pack a whallop of solid nutrition. The whites are almost pure protein, and it is a complete protein with the full compliment of all 8 amino acids. The yoke has gotten a bad rap in the past since it contains most of the fat in the egg, but it turns out that that fat is not so bad for you as they used to think. The yolk also contains most of the other nutrients, including healthy doses of B vitamins and minerals. They have an extremely low glycemic index, a 2 out of 100. When I eat eggs, I feel comfortably full for longer, with steady-burning energy the whole time. I feel best when I pair them with a whole grain and something green. Kale is another of my favorite super-foods. It has similar, almost complete amino acid compliment like eggs, along with a host of vitamins and minerals, including a hefty dose of vitamin A. Kale also has a low glycemic index. I made this dish last week when I had some left over millet grits. 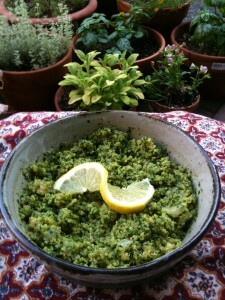 Next time I have some of my Millet-Amaranth-Quinoa blend on hand, I think I’ll make this again. This recipe is for 1 serving, and the quantity of kale is up to you–I like having a lot! Place small pot of water on to boil for poaching your eggs (use a larger pot if you plan to poach more than 1 egg at a time). Add 1 tsp white vinegar to the water (this helps keep the egg together while it poaches). Saute garlic and kale in a skillet. Season with small pinch of salt. If necessary, add a bit of water to steam the kale a bit until you get a texture that is soft but still toothsome. In the meantime, poach your egg(s). Poaching instructions can be found here and here. You want to have a nice, runny yolk at the end. Serve in a bowl large enough for you to stir everything together. 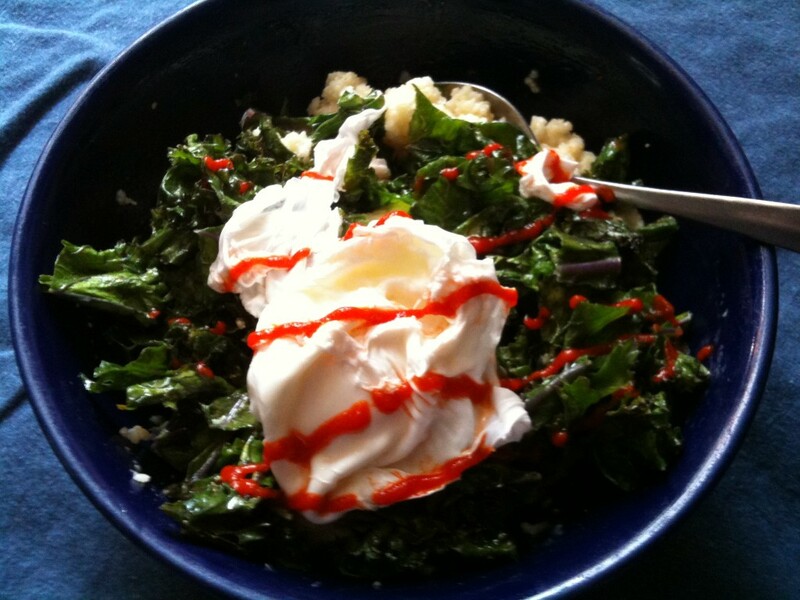 Start with your grains, then top with sauteed kale and then your egg. If you like spicy things like I do, garnish with your favorite hot sauce (mine is Sriracha). Stir, making sure to break up the yolk and stir it in. I’ve finally finished by 10-month yoga teacher training, and while it’s bitter sweet to be done, I’m looking forward to having more time for my blog. I have a lot of recipes to post, and Chinese medicine and yoga to discuss. Today’s post is for my homemade veggie burgers, which are a constantly-evolving, free-form food that I change based on my whim and what I have on hand. I’ve been experimenting with a couple of different recipes and found a nice combo in my last batch. It’s an amalgamation of Molly Katzen’s Tofu Nut Ball recipe (from The Enchanted Broccoli Forrest) and Mark Bittman’s Nut burger (from How to Cook Everything Vegetarian). My version is pretty flexible for the proportions of rice/nuts/tofu–the key is to add enough whole cooked rice at the end to be able to form nice burgers. If you don’t have the time or inclination to make your own burgers, we love Sunshine Burgers. They are gluten-free and made of sunflower seeds and other tasty things. Grind almonds in a food processor to make a coarse meal. Add about onion, tofu, tahini or peanut butter, Sriracha, soy sauce, egg and about 1/2 of the rice. Pulse to form a thick, fairly uniform puree. Dump puree into a bowl and add enough brown rice until the mixture is mold-able but still a bit wet (not sopping wet, just a bit wet). I like to cook these on my double-burner cast iron griddle, but I think they’d also do well in the oven. To cook on your stovetop: heat a thick griddle or skillet to a medium to low temperature. Mold 1/2-3/4 a cup of mix into patties (easier to do this with wet hands). 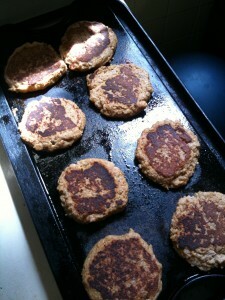 Cook on griddle for 5-10 minutes per side. Turn your burgers carefully–they should hold together pretty well, but need to be handled gently. The idea is to slowly evaporate the liquid out while cooking the egg to hold it together. Keep the temperature low so that your burgers don’t burn while they slowly dry out. To cook in the oven: Preheat oven to 325 degrees. Place patties on a greased baking sheet and bake for about 30 minutes, or until patties are crispy and brown on the outside and cooked through. Serve with whatever burger toppings you like. My favorite toppings are avocado, dijon mustard, and tomatoes. My husband usually likes to melt some cheese on his burger just before it comes off of the griddle. Tonight for dinner I decided to try the Quinoa with Spring Vegetables and Walnut-Kale pesto recipe from this new blog I’ve been reading, Gluten Free Girl and Chef. I adapted the recipe to what I had on hand, and produced something that I think uses the structure of the original, but with a bit different result. I think the key to this recipe is the pesto. You can play with the other details to put more flavor into them, or you can keep it simple and serve a dollop of the pesto over simply cooked quinoa and steamed veggies. I’ve also made a vegan version of this by using a bit of nutritional yeast to replace the romano cheese. Here’s a link to the original posting. Add butter and olive oil to a hot pan, and add onions when butter has melted. Saute until tender, then add rinsed quinoa. Saute until quinoa is dry and smells slightly toasty, adding more olive oil if needed to keep quinoa from sticking. Add 3 cups of stock and 1/2 tsp or more of salt. Put the lid on the pan and bring to a boil. Reduce heat to a simmer and cook for 12 minutes. Removed lid when done to let some of the steam out. Puree pecans and garlic in food processor until uniformly chopped. Add cilantro and kale (you might need to add it in several small bunches). Puree until everything is uniform and drizzel olive oil in while machine is running. Scrape down the sides of the bowl to make sure the pesto is uniform. Add more olive oil if necessary to achieve a silky pesto consistency. Add optional romano or parmeson and lemon juice, blend. Taste for salt and pepper. Saute the other 1/2 onion in olive oil. When it starts to soften, add cilantro and toss briefly. Add steamed broccoli and toss until reheated. Add quinoa and peraps a bit more olive oil, gently stirring to combine and maybe brown some of the quinoa. To serve: either toss quinoa/veggie mixture with all of the pesto, or spread a small amount of pesto on the plate, and top with the quinoa-broccoli mixture. Top with 2-3 tablespoons of kale pesto, or to taste. Top with some grated cheese, if desired. Congee or Jook is a special rice porridge eaten throughout Asia when someone is sick or feels the need to eat simple foods to cleanse the system. Traditionally, it is made of white rice cooked slowly in a large quantity of water, i.e. 1 cup of rice cooked in 3-8 cups of water for however long it takes to become a thick porridge. It is extremely bland and very gentle on the system. I often make congee with whole grains, and then I add other things for flavor. For breakfast, I might add some dried fruit and nuts, and maybe a spoonful of agave nectar or honey. For lunch I like to add some sesame oil, soy sauce, cooked edamame, spinach, and if my tummy feels up to it, some chopped green onions. If you have the time, it’s nice to soak the grains to help make them easier to digest. I like to use brown rice, and often add other grains like quinoa or millet. If you are not avoiding gluten, whole barley and wheat berries are nice, too, but they work best when you soak them ahead of time, and add the maximum amount of water when you cook them. Whole oats, or even steel-cut oats are a nice addition, too. Whole grain congee is not tradional, but I think that when you soak the grains, and cook them for a long time, they can be gentle to your system, and more nutritious than traditional white rice congee. Since this is such a simple dish, make sure to use the best quality ingredients you can. The quality of the rice in particular is important, as is the rinsing and drying process. Use fresh greens and a salt that really tastes good. * 1 cup white medium grain or Japanese style rice (see Looking at Rice). Rinse the rice with several changes of water (see How to wash rice) until the water runs clear. Drain the rice into a colander, and leave for at least 30 minutes to dry. Wash the greens. If you are using any slightly bitter or tough greens like kale, collard greens, daikon radish leaves (not sprouts), turnip greens, puntarelle or cabbage, blanch them briefly in boiling water, drain and refresh under cold running water. Tender greens can be used as-is. Chop up all the greens. You should end up with about 1/4 cup of cooked greens or 1 cups of raw greens, or a mix of both. Put the rice and the water in a heavy bottomed pan (traditionally you might use a donabe or earthenware pot, but I just use a cast iron enameled pot). Bring up to a boil, then lower the heat to a gentle simmer. Cook, while stir up the rice from the bottom of the pan occasionally as it cooks, so that it doesn’t burn or stick, for about 40 minutes, until the rice porridge is creamy, like a loose risotto. Add 1 tsp. salt and stir. Just before serving, add the prepped greens and stir in well. Serve piping hot, with additional salt on the side that people can add to taste to their bowls. Congee cooks up nicely in a crock pot–just set it up before bed and you’ll have a nice porridge in the morning. I make mine on the stove and reheat it as needed (though Maki doesn’t recommend this. I find it works just fine for me). In my attempt to eat primarily whole grains, Iíve found a few shortcuts that make it possible to fit the longer cooking time into my busy work schedule. First, I generally make a large pot of brown rice mixed with some millet at the beginning of the week. Iím not too exact about the ratio of rice to millet, but I generally try to make 3 cups total, usually a 1/2 cup of millet and 2 1/2 cups of brown rice. They cook together nicely, and the millet doesnít really change the flavor too much while adding a lot of nutrients. (It contains iron and some other helpful minerals, B vitamins and protein.) You can do this same thing with white rice to improve itís nutritional value without changing its taste too much. This big pot of rice allows me to simply re-heat it any time I want some rice with a meal, without the 30+ minutes of cooking time. My other favorite pre-cooked grain combo is a blend of quinoa, amaranth and millet. I generally make about 2 cups total, with roughly 1 cup of quinoa + 3/4 cup millet + 1/4 cup amaranth. These grains also cook nicely together in about 12 minutes (like white rice). Quinoa and amaranth have a heavy dose of high-quality protein (similar to egg white, which has the highest quality protein around), as well as large quantities of minerals (like iron and magnesium) and B vitamins. I generally use this grain blend as a breakfast porridge. I re-heat it in the morning with some soy milk, and add raisins, nuts, cocoa nibs and a bit of honey for a super-healthy, super-filling start to my day. Both of these whole grain blends contain ample fiber and have a low glycemic index, making them filling, slow-burning energy generators. Both blends cook well with a standard 2 parts water to 1 part grain ratio. For the brown rice, I generally add and additional 1/4 cup of water since it cooks longer. Itís important to add 1/2ñ1 teaspoon of salt to bring out the natural flavor of the grains. These grains are also gluten-free and allergen free, so theyíre a good choice for people with food sensitivities. For more information about the nutritional makeup of these grains, you can check Nutritiondata.com.